Insurance for PE firms. As Paul Brennan, Chairman of private equity-backed OnApp highlights, "A succession plan is not only good for the business but for its potential buyer – it's the insurance that underpins the value of the existing team. If an acquirer comes into a business without a succession plan, it's really only buying the IP." "Buy and Transform" Model. PE firms nowadays don't simply buy to sell, or buy and hold their portfolio companies. Rather, they buy and transform. Historically, PE firms added value to portfolio companies through its data-gathering and number-crunching capabilities. However, value creation today requires more; over 50% of a firm's value can be attributed to intangibles. Don't Hire Management Based Solely on Credibility or Experience. Experience can be overrated. This can quickly rule out many talented contenders or yield candidates inclined to recycle strategic plays that aren't tailored to the new company. PE firms should be open to hiring "nontraditional" candidates without Ivy League degrees and who've taken more unusual paths in their careers. Soft skills including authenticity, teamwork, a bias to action, and resilience are also key. Don't Fail to Keep a Stable of Great CEO Contenders. 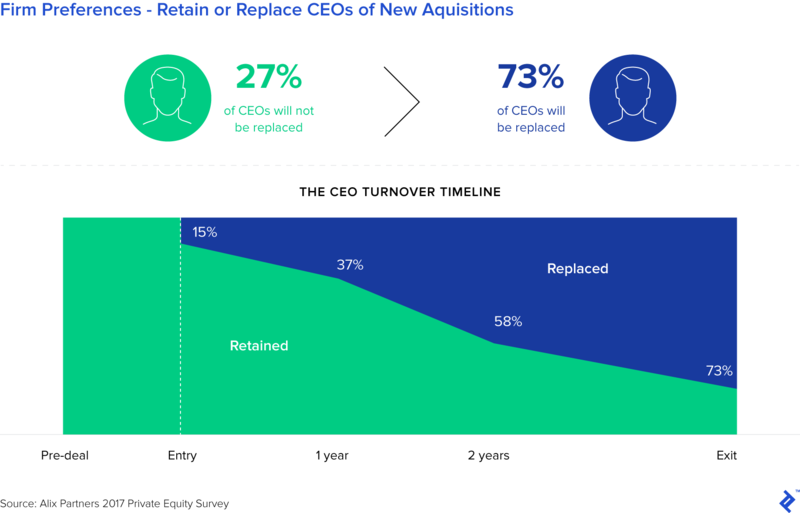 While it's always important to align incentives for and support the management team, PE firms should also be prepared for the possibility of having to replace them with someone new. 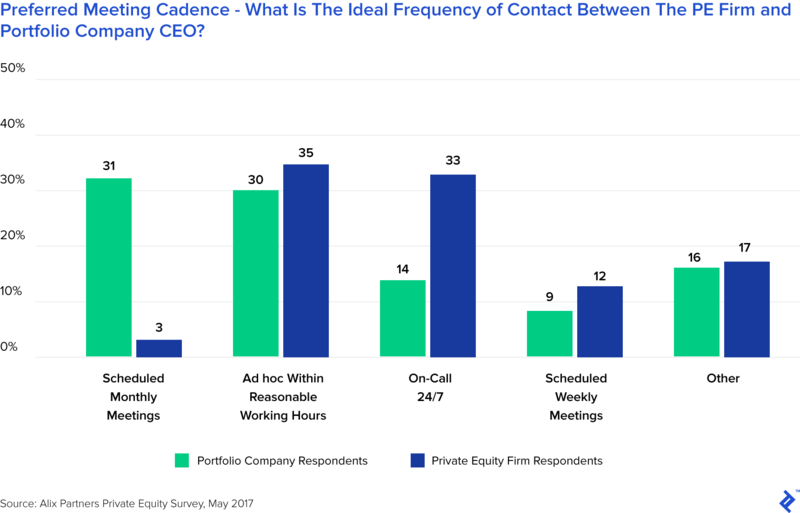 Experienced PE firms anticipate the potential need to take decisive action by keeping a pool of experienced executives on call and who can be trusted to fulfill management duties. Do Go Beyond the C-Suite. Companies without multilevel succession roadmaps are inevitably less agile than those who do when it comes to changes in technology and industry. If selling a business relies on only one or two leaders, buyers become wary of the financial future of the company and likely won't pay as much for it. Do Rigorously Assess Soft Skills While Recruiting. Often, the skills most difficult to assess seem to be the crucial ones. Of the portfolio company executives surveyed, 67% say that leadership skills allow them to perform at the highest level, while 46% place a similar importance on strategic thinking. 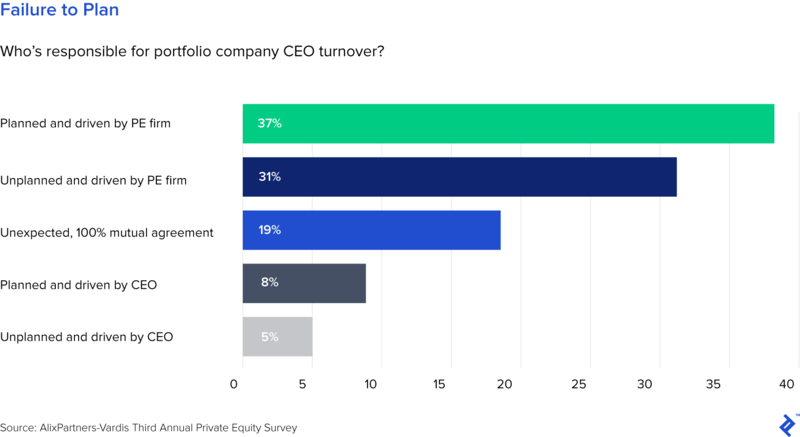 Clearly, it's important for PE firms to take alternative approaches to CEO assessment, including independent third-party assessment. These types of assessments often combine interviews with behavioral and psychometric testing. Do Consider Hiring a Leadership Capital Partner (LCP). 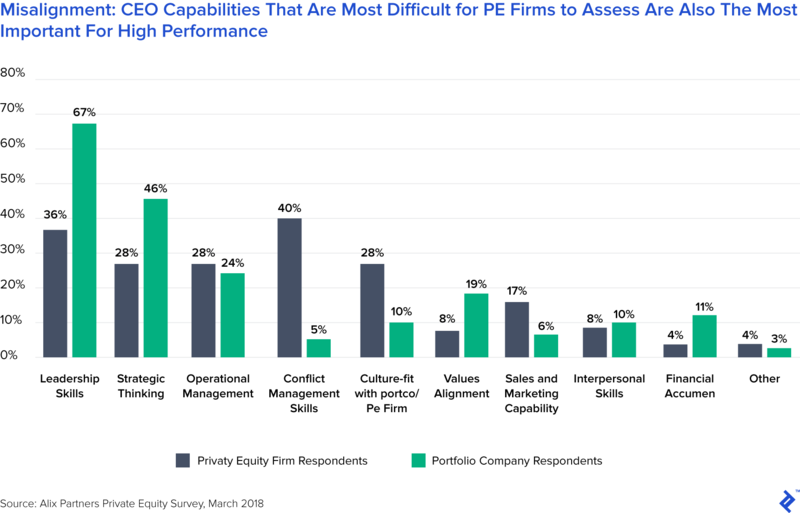 Today over half of PE firms now employ leadership capital partner (LCP), who help PE firms conduct data-driven evaluations of a potential target's leadership and culture. Once a company has been acquired, the LCP facilitates the transformation. LCPs also often take part in divestiture negotiations, highlighting leadership and culture to help attain favorable pricing. Maintain Incentive for the Next Generation of Leaders. As a Preqin report notes, it's key to ensure that the economic structuring and incentives are allocated according to party involvement. As senior partners' involvement diminishes, they must also be willing to decrease their economic interest in the funds and partnership. One way of doing so is reassigning the carry or setting up new management companies for the funds, which will allow for senior partners to wind down ownership.